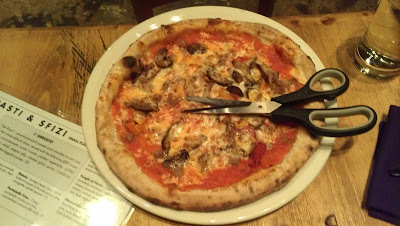 Even our newest readers should be familiar with our newest food crush, Double Zero Napoletana. Our last visit was such a wonderful experience that we gave it an "A" on our rather tough grading scale. So, when we got an email from them yesterday informing us about their Pizza Making Class, we immediately hopped on the phone and made our reservations. If you are interested in learning how to make pizza in the original Neapolitan style on Double Zero's handcrafted Ferrara ovens, make your reservations TODAY!!! It's $39 per person and it includes a glass of wine and your very own pizza creation. You will be guided thru the entire process by their expert pizzaiolos so this will be a fun and safe night out that should be capped off by a full tummy. Fellas, this could be a GREAT date night! !